Did you know that the health condition of your pet's mouth directly affects overall health, quality of life and behavior? 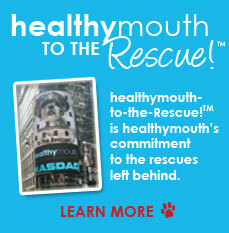 A healthy mouth is the gateway to a healthy pet. This is not about cosmetics, or white teeth or even fresher breath. This is about a painful, progressive disease that 80% of dogs and 70% of cats suffer by age 1.5 years. This is about the No. 1 health issue seen by veterinarians today. And perhaps most surprising is to learn that your pet's mouth acts and reacts exactly like yours. What does this mean? This means that just like you, your pet's mouth requires annual examination and veterinary dental cleaning followed by daily home dental care. 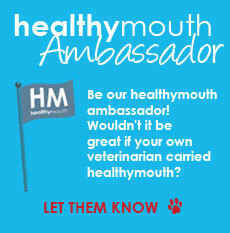 What healthymouthTM will do is keep your pet's mouth in the clean, plaque-free state that has been achieved by professional cleaning. Plaque that hardens to tartar is loaded with bacteria that if left untreated can go into the bloodstream causing damage to vital organs or even pre-mature death. The only way to remove tartar from your pet's mouth is by professional cleaning performed under anesthesia by veterinarians and highly skilled veterinary technicians. But even the best professional cleaning must be followed up with a daily home dental care program. And that's where healthymouthTM comes in. It takes less than a day following a cleaning for plaque film to form and only two days for the plaque film to begin to harden to tartar. Using healthymouthTM immediately following cleaning, or extractions (if necessitated), will dramatically reduce plaque and the oral diseases that it causes. Veterinary examination followed by professional annual dental cleaning and ongoing, daily home use of healthymouthTM work together as a comprehensive dental care program*. It is definitely the best investment you will ever make. *Brushing is the gold standard. 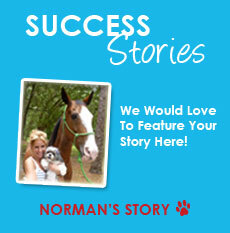 I will share a secret with you from my first had-experience with Ping-Pong and confirmed by other pet owners. The only reason it is so difficult to brush your pet's teeth is because that mouth is in pain! Once the pain has gone away, your pet will not only let you into the mouth, but will welcome it. Just ensure that all dental care products you use are proven effective, chemical free and safe.